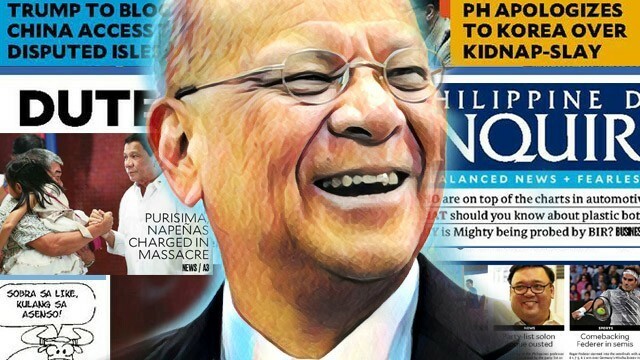 San Miguel Corp. CEO Ramon S. Ang is in talks to buy a majority equity stake in media company The Philippine Daily Inquirer (PDI), one of the country’s biggest English-language dailies that helps frame national debates and discussion. “This culminates a series of talks that began between the two parties in 2014, and restarted early this year after the Prieto family completed its annual review of business plans in the Inquirer Group and other business interests,” the statement said. If completed, the deal marks a major milestone in Ang’s growing media investments, which include a reported stake in Solar Television, the operator of CNN Philippines and other cable channels. In 2015, he made a Php1-billion down payment for a 34 percent stake in GMA Network, the country’s second biggest broadcaster by revenue, but the deal did not push through. The potential deal boosts the media footprint of Ang, the country’s 11th richest billionaire with a net worth of $1.5 billion as of March 2017, allowing him to match the media power of another conglomerate, the Metro Pacific Investments Corp., led by Manuel V. Pangilinan. The MPIC group controls a television station, TV5 Network Inc, and has investments in the Inquirer, the Philippine Star and BusinessWorld newspapers. With the planned acquisition, three of the country’s leading English-language newspapers and two of its three biggest television stations will be in the hands of the owners of the country’s largest diversified conglomerates. Ang’s “investments and business expertise will unlock added value in the Inquirer Group’s newspaper publication, internet communications, social media, corporate skills training, radio broadcasting and logistics delivery,” the statement added. Four major groups own more than 90 percent of Philippine Daily Inquirer Inc. These are LRP Inc., which holds 59.71 percent; Excel Pacific Holding Corp., 13.08 percent; Mediacom Equities Inc., 10.04 percent; and Inquirer Holdings Inc., 10.29 percent. The company’s net income plunged by more than half to Php38.4 million in 2015, the latest reports available at the Securities and Exchange Commission (SEC), from Php80.8 million the year before. Revenues also fell slightly to Php2 billion from Php2.2 billion. The Inquirer was on the receiving end of President Rodrigo Duterte’s ire in recent months for its stories critical of the administration’s bloody war on drugs. The President has also slammed the Prietos’ alleged non-payment of taxes on its Mile Long Building in Makati City, threatening to seize the property and return it to the government.